Normal difficulty played out more or less the way that I expected with the Shinobi class. I picked up the standard early game upgrades over the first few runs, then concentrated the rest of the stat gains into Health, Attack, and Armor. The Shinobi is a pretty simple class in truth; there's not much more to it than hitting monsters and trying your best not to be hit in turn. Magic is almost irrelevant. My characters always had damage in spades, counterbalanced by a lack of health that meant runs were also always in danger of a quick demise. After the last successful victory in Normal difficulty, I turned the resulting gold into more stats and a minor rune swap for additional lifesteal. Still the same Shinobo with Tunnel Vision and PAD traits, now with an extra Vampire Rune in place of the former Balance one. This run was characterized by huge amounts of equipment dropping, something that seems to happen frequently for the first heir to reach New Game Plus difficulty. 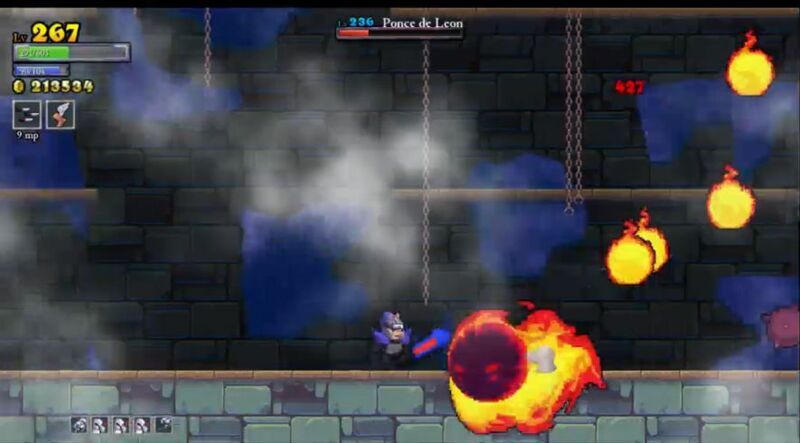 Rogue Legacy won't drop certain gear until your character has moved beyond Normal difficulty, and so therefore a good run in NG+ tends to result in the floodgates opening up. I managed to get through the castle, forest, and tower with this guy, which resulted in the appearance of the following items: the Guardian Sword, Imperial Sword, Imperial Helm, Dragon Helm, Royal Helm (it's a fire sale - all helmets must go! ), Dragon Chestplate, Holy Chestplate, Imperial Limbs, Dragon Limbs, Royal Limbs, and Holy Cape. That's 11 total pieces of equipment from a single run, whew! 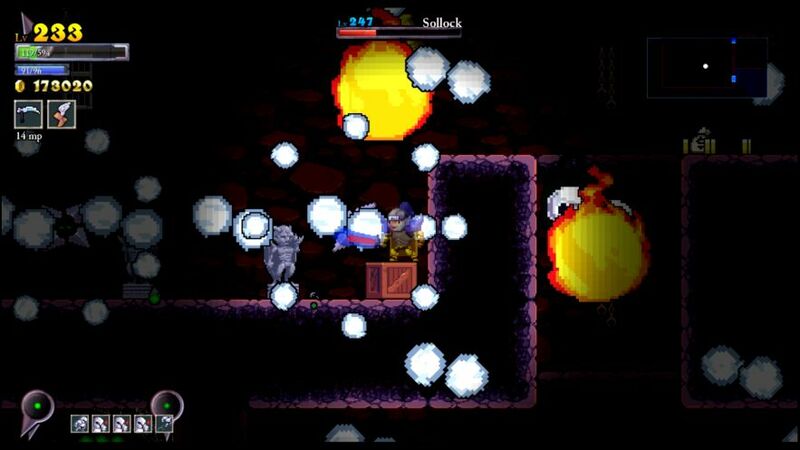 The Holy stuff appeared as a result of miniboss fights, as I took down Botis twice and the duo flying mages once. And while much of that gear was useless, there were some priceless gems in there as well, specifically the Imperial Sword, Royal Helm, and Dragon Chestplate. I would end up needing eight equipment upgrades just to put on the new items. They were very much worth it, if pricey. As for the fighting itself, the Shinobi continued to be a glass cannon class with very high damage output (148 damage per swing would kill almost everything in two hits, three for the highest HP monsters, and only one hit for weak foes like eyeballs) which was counterbalanced by the small lifebar. For now, the lack of tier three enemies and +5 HP per monster kill had things tilted in my favor. This ninja made it down to the basement, where he perished in the first couple of rooms. It was an excellent run nonetheless, especially with all of those items popping up. You get significantly less gold when a full dozen of the treasure chests have items inside! No traits at all and the blade wall spell. A pure Shinobi. This guy was sporting a shiny new look, with the bright yellow Imperial Sword and the red Dragon Armor. I was almost regretting the inevitable finding of more Royal gear, with the dull gray color that all of my characters end up sporting eventually. This run started off by heading into the tower almost immediately, not something I planned out ahead of time. I happened to find the entrance quickly and went on inside. The monsters in there just did not present very much of a challenge, and it seemed as though I had enough stats to sustain through their potential damage so long as I kept my Shinobi out of any true stupidity. I think the highlight up there was getting a fairy chest in a "No Jumping" challenge by using the innate class blink ability as a second air dash over some spikes - ha! I also used the blade wall once to kill a planky (star-shaped shooting enemy) in a narrow passage where I could not have used the melee sword attack without taking damage. Otherwise, it was a straightforward massacre, with my ninja never falling below 300 health. If the tower was easy, then that meant that the castle was a total breeze, and I rushed through there looking for the entrance to the basement. 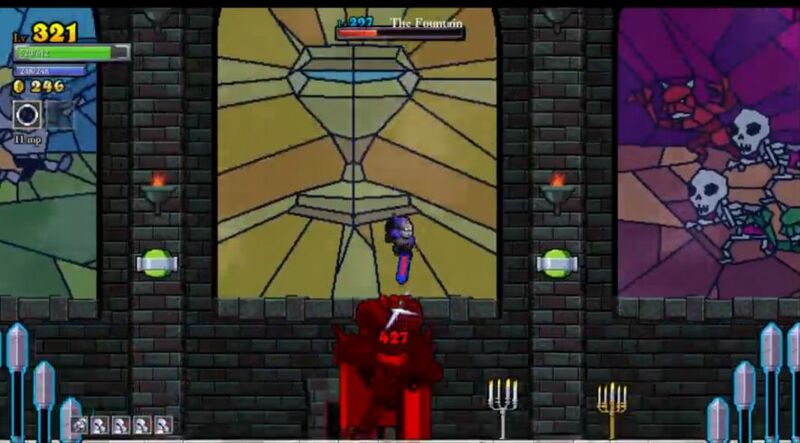 The most interesting battle in the castle was a Sallos miniboss fight, something I rarely get a chance to experience. I think that I've just about got the pattern down for the big painting, it involves letting him move in a circle around your character. 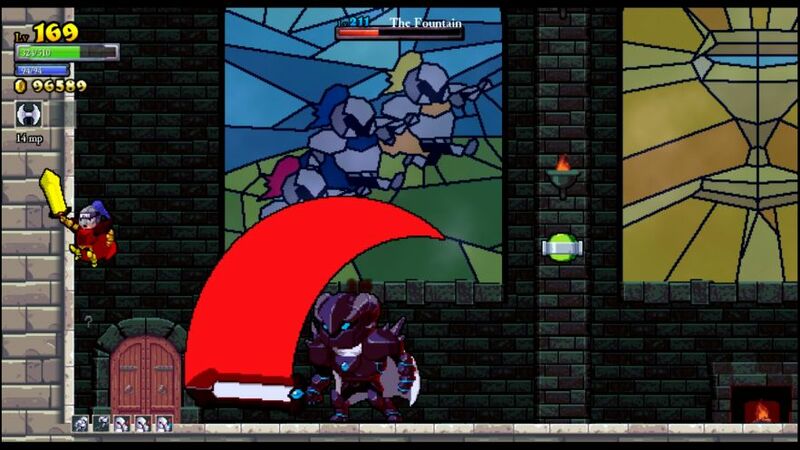 Like the smaller evil paintings, too much running and jumping around tends to get you into trouble. From there, I alternated working over the basement with retreating into the castle to restore some health in an easier area. The Land of Darkness was definitely the toughest part of the overall dungeon, but with some careful play I managed to get through there without any real crisis moments. The remaining areas of the forest went down after that without much fuss. This was another good run for gear, with my Shinobi bringing back five runes and six pieces of equipment, including three different types of Slayer stuff. Sadly all of it was useless, not as good as things I already owned. Ah well. Ambivelous trait (spells come out backwards) and the conflux spell. That combo meant that I wasn't going to do much spellcasting with this guy, not that any of the Shinobis had done a lot of that. As expected, this was a pretty straightforward clearance of the full dungeon without any moments of distress along the way. 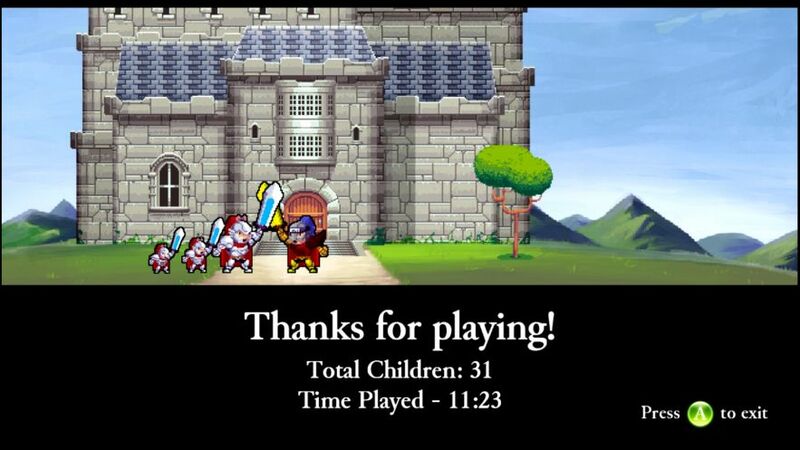 I was able to fight Botis twice, winning +1 to Strength for the first battle and the Royal Sword for the second victory. Those were both very nice prizes! Sadly none of the other minibosses showed up along the way. I was able to clean up EIGHT runes along the course of this run, adding to the overall haul. I actually think that I picked up every rune that I had any chance to get, not counting those ones that are stuck behind walls and can't be reached without the proper spell. I was now sitting at 48/55 runes for the whole game. Soon enough the dungeon was clear and I was heading off to fight the final two bosses. This kind of scenario can be a bit nervewracking, knowing that the first 45 minutes or so of playtime is nothing more than a warmup for the ending bosses. The bad news was that I played both bosses poorly, taking hits that I should not have taken and generally flubbing up the whole thing. My fight against the Fountain in particular was just sad, as he hit me repeatedly with the melee sword attack that's incredibly easy to dodge. The good news was that it didn't matter, since I apparently had enough damage and health and armor to tank my way through to victory. I wasn't too proud of this, but at least it beat having to run the whole dungeon again! On to NG++ difficulty. The main thing to do with all of that gold was unlock the new gear found along the way. The Royal Sword added a nice bonus to damage, and the Guardian Cape finally gave me something to wear in that slot. (I'd been skipping all capes to this point because none of them seemed worth the expense.) I was also able to get a third Vampire Rune in play for +6 HP per monster kill, after shuffling around the rune setup a bit. There was enough cash left over to max out the health stat at 75/75 points, and dump the rest into a few attack upgrades. I'm never quite sure what to expect from the first character to enter NG++ difficulty, since the challenge level increases so dramatically. Fortunately this Shinobi exceeded all of my expectations with a fantastic and lengthy run. The very first room had four infernites chasing me around next to a painting, and somehow I managed to get past them in a very narrow corridor without taking any damage. I worked through the castle first, as usual, and had great success outside of one vertical room where a pair of McRib skeletons tossed down an endless series of bone volleys from out of reach. I fell down to 225 HP and rebuilt health from there, including a flawless victory over the dual mage minibosses that produced a bonus to Attack inside the resulting tresure chest. Two chickens dropped back to back at the end of the castle in a nice swing of luck. I had relatively few problems in making it through the forest and tower as well, finding a steady stream of recovery items along the way. Monsters mostly died in three or four hits, with some of the more frail ones dying in two swings. (Nothing died in a single hit anymore, and it's not like I could critically strike!) The toughest battles came in "defeat all monsters" fairy chest rooms, and I used up most of my teleporter chickens in fighting a pair of them, one in the forest and one in the tower. I did get both runes, at the cost of all those chickens. Eventually this run came to an end towards the top part of the tower, with just over 150k gold in tow. The big find was the Royal Chestplate, which became an immediate purchase afterwards. (I'd found some other good stuff, including the Dragon Sword, but nothing better than my current setup.) The rest of the money went into a boatload of Attack upgrades, 22 of them in all. I figured that they were more important than points in Armor for a class that relies on hitting and killing enemies before getting hit in turn. Another good run like that would come close to maxing out the physical damage stat. Nearsighted, Gigantism, and the scythe spell. 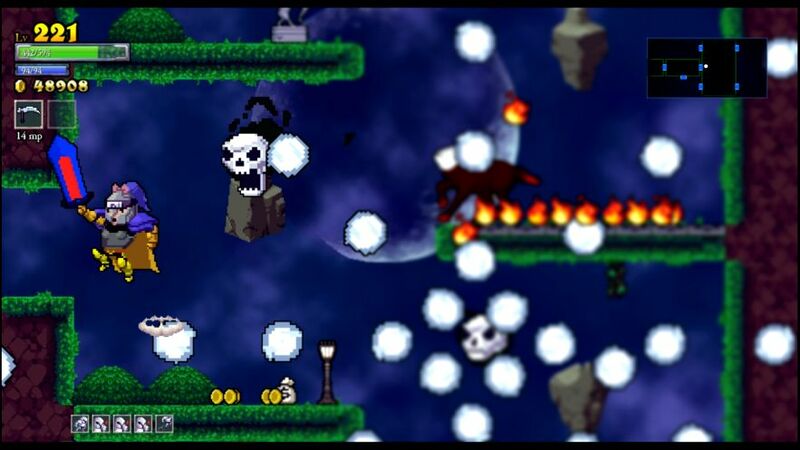 This character had a humongous sprite model, making it tough to dodge the many projectiles that the monsters shoot on this difficulty level. 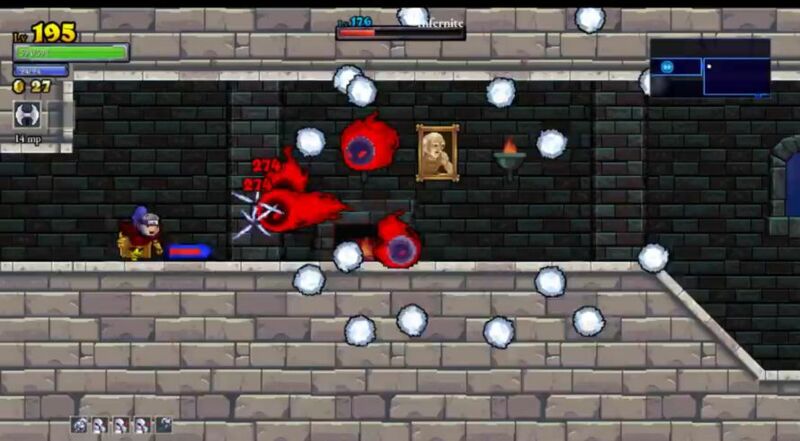 I started out on the wrong foot almost immediately, when a zombie hit me twice in the second room of the castle. My Shinobi's fat sprite was too large to get out of the way, argh! At least I was able to pick up a fairy chest using the scythe shortly thereafter, one of the challenges with monsters behind a wall that only the scythe can get. I had more trouble in one of the rooms with constant fire traps up by the ceiling; my gigantic ninja literally could not avoid the combination of those fire shots along with a room full of McRibs and doom paintings. I just got pounded in there, and there was very little that could be done. Frustrating. Things settled down at the back end of the castle though, and I managed to finish the first area with over 400 health (albeit having used most of the chickens at the teleporters). The forest was even worse, a neverending bullet hell from start to finish. 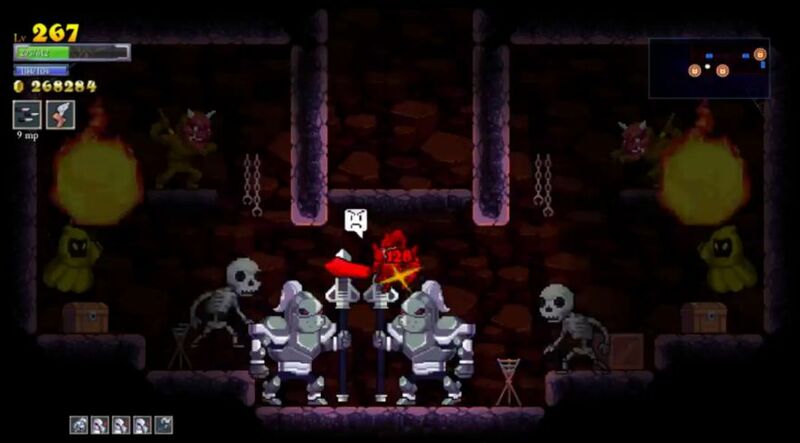 There was one particularly bad room with double McRibs stuck behind a wall where they were unreachable, but I had to pass through their storm of bones to get to the next room. With the huge character sprite (not to mention the blurry screen everywhere immediately beyond my character), this was not a fun area. I did not make it through the forest, and I did not have a lot of fun with this Shinobi. On the positive side, I only needed to find one more rune to complete the set of 55. Coprolalia and Dementia. I felt noticeably smaller with this guy, and it was nice to be able to see clearly again. The start of the run through the castle was very clean, no major issues and only a few hits taken. I was able to save all of the health recovery items for the moment. I hit a snag in the beginning of the forest, with a room layout featuring more of the bouncing spiked balls where I couldn't manage to dodge taking damage. Really getting tired of those things! I dropped as low as 100 health at one point, only to eat a combination of randomly dropping chickens and teleporter ones to get back into the safe zone. There was a miniboss fight against the duo skeletons in the forest as well, and a flawless victory produced the Dark Cape. That was something I'd been hoping to see, as it was a perfect fit for the non-critically striking Shinobi class. (Plus the black cape makes you look awesome!) I cleaned up the final rune in a fairy chest in the forest and began picking up the first stat bonuses after that. The first one was a Strength upgrade, very nice. The tower was up next, where I found the going to be on the smooth side once again. I had enough health to fight the duo plant miniboss, and they dropped the Dark Limbs after a tough battle. That was another piece of equipment that I planned to use after the run was finished. Soon enough the tower was done, and it was time for the basement. Unfortunately I was smacked by a gradiator in the second room for 223 damage (!) in the process of dodging four other monsters. That put a bit of a dent in the lifebar. Shortly thereafter, there was an absolutely crazy room packed with a crowd of mages, plonkies, and plant monsters. I took hit after hit, and limped out of there with barely any health remaining. That cleared out the last of the saved up chickens. I hoped that I would be able to make it through the rest of the basement for a full dungeon clear, but it was not to be, as I fell with less than a third of the area remaining. 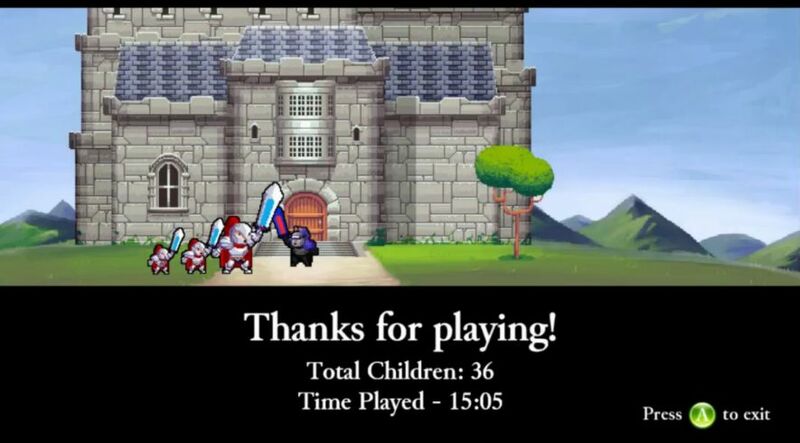 That was about 90% of the overall dungeon finished. Hopefully the next Shinobi would be able to finish it off. The Dark Limbs and Dark Cape took a combined 11 equipment levels to put on! Pricey. The rest of the gold went into maxing out physical attack and piling on more armor. Coprolalia and the dagger spell. 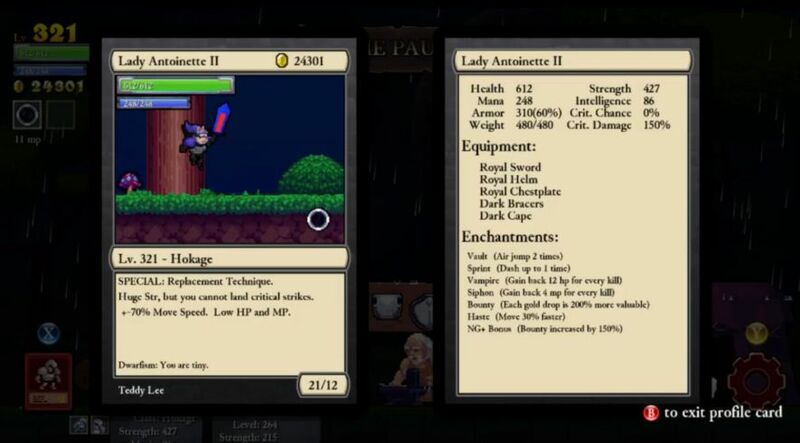 This lady Shinobi had maxed out the Strength stat for a physical damage value of 421, and with the addition of the new Dark equipment, she now had three air jumps (more than needed!) and +10 HP per monster kill (much more useful). The black coloring on the new gear also looked pretty sweet. With physical damage finally maxed out, many of the low health enemies died in as little as two hits, although I wasn't able to one shot anything. There were a lot of eyeballs shooting at me from behind walls in the castle, and they hit me more times than I would have liked. The extra vampirism from the Dark stuff kept me in the safe zone. After clearing out the castle, I went ahead and fought Khidr, taking two hits in the process. Not my best boss fight. The forest was up next, and presented few problems to a Shinobi with this many levels. The most interesting thing to take place in these first two areas was popping a Health bonus from two different fairy chests. That took me up to exactly 600 HP - nice. Alexander was up next and he didn't even put up a fight, rolling over and dying in about ten seconds. One of the little flying skullheads managed to hit my ninja once, that was all. The worst room was the very last one in the forest, packed with a mix of monsters with nowhere to escape damage. A sloppy fight here dropped my health down under 200 total life, and a crowded initial room in the tower took that down under 100 HP. Now I needed to go back and eat some of the saved chickens after sitting on max health for virtually the entire run up to that point. Sigh. I spent the rest of the tower laboriously refilling the lifebar, getting without shouting distance of full before making mistakes and taking unnecessary hits that threw it all away. Down close to death again, I was forced to eat the remaining chickens at the teleporters. I went into the Ponce battle under half health, in the expectation that I could kill the boss without taking much damage. This confident assumption turned out to be correct, and I downed the big fireball without taking a single point of damage. 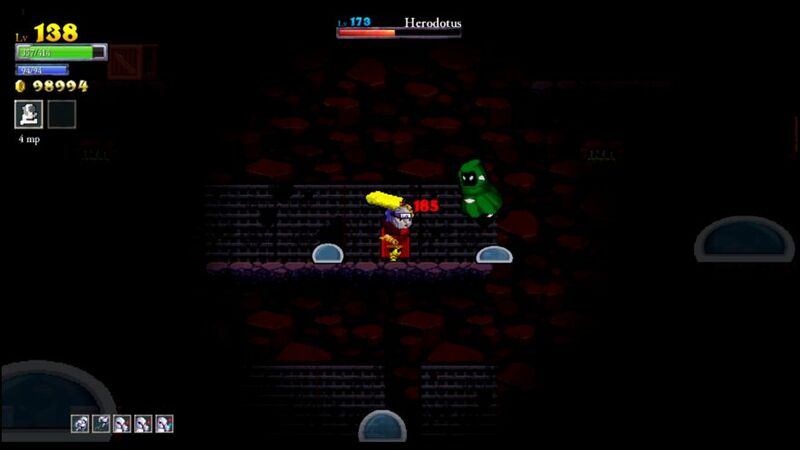 Now only the basement remained, and after finding a random chicken near the boss room, I decided to fight Herodotus right away. It only took two hits to defeat each blob, and with my vampirism from gear, I was actually gaining health throughout this battle. Finished with a completely full lifebar, heh. This could have been a 99% full dungeon clear if I'd been willing to skip one impossible room. Look at that absurd picture above: two corrupt lords, two McRibs, two fire mages, and two enemy ninjas. There is no possible way to do that room without taking a truckload of damage. I should have skipped this one, but I can never turn down a challenge. 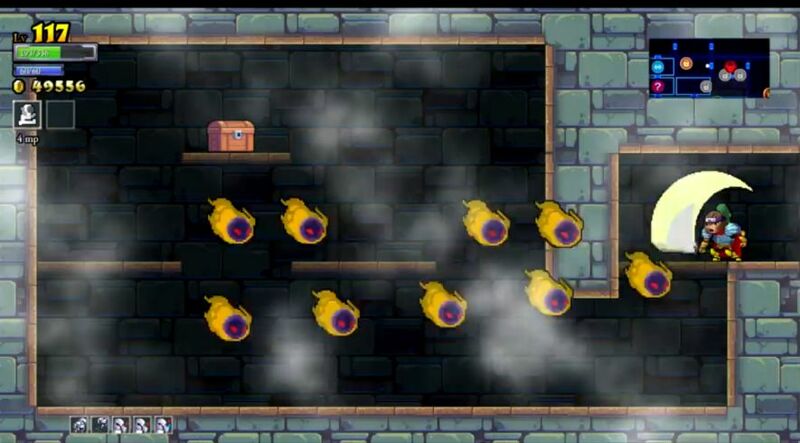 While I did manage to clear that room, it cost me all of my health and the few remaining teleporter chickens. I died with about half of the basement still uncleared, with 281k gold in tow. This gave me enough money to finish maxing out the Armor upgrades along with the Down Strike and Mana Cost Down levels. I also converted one of my extra jump runes (Vault Rune) into another Vampire Rune, not needing three different air jumps. The rest went into 36 mana upgrades, which were almost completely pointless. My Shinobi was effectively maxed out at this point, and I didn't see much point in continuing to farm the whole dungeon for additional gold. All the bosses were dead now, and I would charge straight after the endgame pair. Dwarfism. I don't really like having the dwarf characters for the final fight against Johannes and the Fountain because of their small sword graphic. Not that it mattered at all in this situation, however; Johannes was unable to hit my ninja even one time. The damage output from the Shinobi class was as impressive as ever, and I think it only took about 15 hits to knock out the first boss. The Fountain began the second half of the fight by using his pound the ground attack twice; he was already down to about 30% health from my pogo jump attack by the time these two finished. I smacked him a few more times with the sword (and even the chakram for its minimal damage), and that would be it. The dungeon itself is definitely harder than these two guys in NG++ difficulty. These were the final stats for my Shinobi at the end of the game. The damage was ridiculous from start to finish, and even here in NG++ difficulty I had no trouble hacking through enemies in two or three hits. The Shinobi class honestly doesn't begin to fall off until you reach even higher difficulties than this, at which point in time it collapses off a cliff due to the inability to make use of critical strikes. 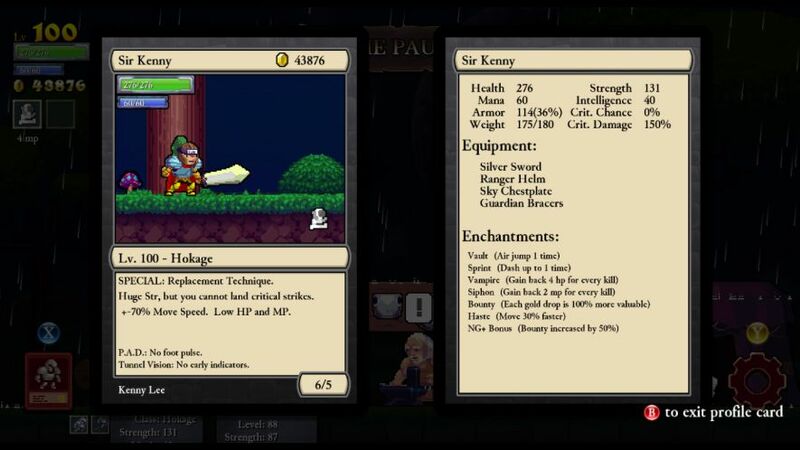 It's quite interesting how this class seems to be regarded with vastly different values by different segments of the Rogue Legacy community. Newcomers love the Shinobi and think it's one of the best in the game. These are the folks who I see playing the game on Livestream with a full set of Blood equipment and two dozen deaths before hitting Level 20, heh. Then at the other end of the spectrum are the experienced players who love grinding, playing the game at some absurdly high New Game Plus level, who regard the Shinobi as complete garbage. And they're not wrong to think that, in those extreme lategame conditions this class doesn't work very well at all. For my purposes here, I value the class somewhere in between. It's definitely inferior to the Assassin class, largely because the Assassin has more health and a drastically better class ability in the smoke cloud. The Assassin also has a better lategame, of course, and can handle those NG++++++ scenarios where the Shinobi doesn't cut it anymore. The Shinobi's massive non-crit base damage really does work well for the first three difficulty levels though, and for that reason I think that this class is somewhat undervalued. It's a shame that there's another class that's so similar that happens to be a stronger choice. 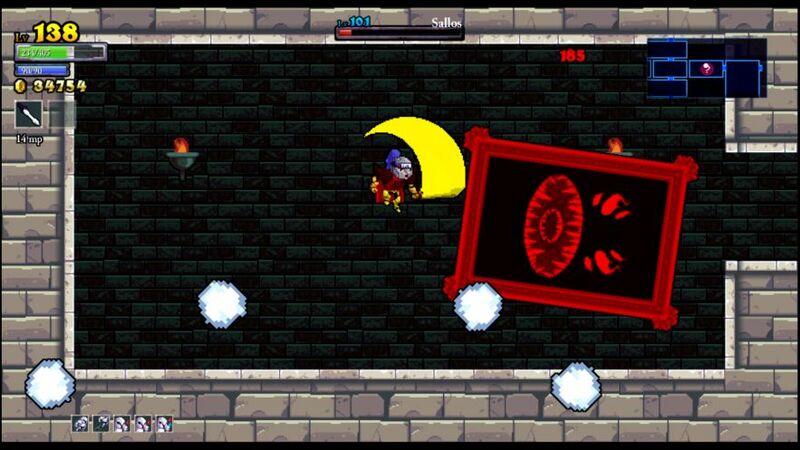 The Shinobi is still one of the game's stronger choices overall, far superior to weaklings like the Lich and Miner. This was my fastest class to play according to time on the clock, and it wasn't particularly close. All of the other runs took at least 20 hours to complete NG++ difficulty level - quite a difference there! Part of that was my increasing familiarity with the game, but I do think the innate movement speed bonus that these ninjas get also played a factor. Shinobis simply move faster through the dungeon. As far as number of heirs, this run needed 18 in total, just behind the other strongest classes (Barbarian and Assassin). I'll have to do a full comparison at some point. The secret Dragon class is the last one remaining, a class that doesn't play out anything like the others. It should be... interesting.